That's why I love maxis....they always work...even with a baby bump! You look fabulous in both outfits. I can't believe it's your third trimester already! What a greataxi skirt! The second outfit reminds me passion fruit and mango! Haha :) cooper looks extra cute today and a wee bit teeny! Did he have a hair cut?! Must just be camera angles - Cooper is fluffy and scruffy as always, will be due a cut soon! You look so beautiful, dear Mica! I love the striped t-shirt outfit (I have so many stripes in my closet...obsessed)...and the maxi skirt outfit is spectacular!! Maxi skirts were a saviour for me during pregnancy as well.. Thank you Irina :) You can never have too many stripes I think! Third trimester already, gosh it's going fast. You look gorgeous, I think that pregnant women are the most beautiful! 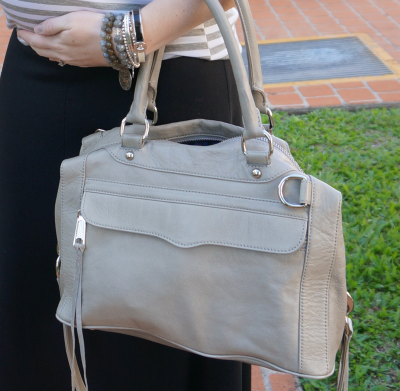 Great ombre maxi skirt - great purchase for the growing bump. Hi dear! Gorgeous looks with maxi skirts, I must admit I don't own any yet. Thanks for the inspiration. :) And I love your bracelets. Need more jewelry on my arms. I love maxi skirts - would be lost without them! Nothing like a classic stripe top. Looks great with the matching bag! I can’t believe how fast this time is going! Thank you! Counting down the days, haha! Looking fantastic Mica. Pregnancy suits you and loving your style! You look stunning my dear! Your second look is WOW!!! So adorable! That ombre skirt is so perfect! I love how loose shirts work so well during pregnancy. 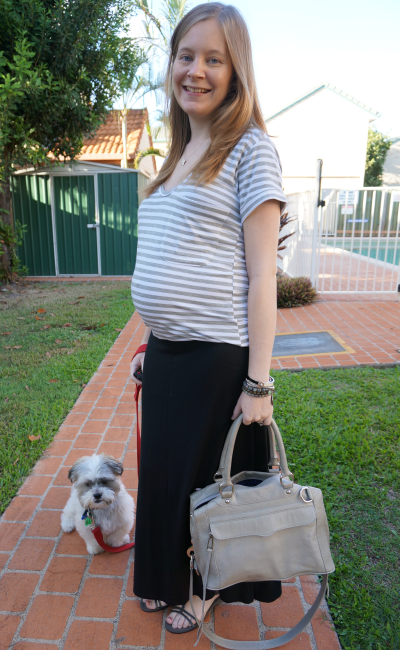 I definitely bought a few skirts when I was pregnant and they worked so well! I really love that second outfit! The colors in the skirt and tank are cheerful. You look amazing! I like your colourful second look with the red tank top. It seems like the baby is growing wonderfully well and not you . Wow - I cannot believe you are already in your third trimester, girl! You're looking stunning as always! Your RM bag looks so soft and perfect!